In a previous blog I talked about my work pumping room. It has two chair separated by two curtains. I would say about 50% of the time I pump alone. It is a great time to FaceTime with my husband and see the baby to help my milk supply or a nice quiet rest to be able to write a blog. The other 50% of the time when I walk in there is the distinctive whirring of another breast pump. Every pump and every brand has a very distinctive sound. Nine times out of 10 I know exactly who is behind that curtain based on the sound of their pump. Yesterday was no exception. Usually through the course of time and conversation, I get to know the other moms behind the curtain. I’ve pumped with nurses from every floor and unit, chaplains, administrative assistants, and students. We talk about everything related to our babies: their ages, their developmental milestones, and how much they’re sleeping at night. The biggest topic of discussion, though, always is milk supply. Typically there is only ever one other mom in the pump room. However yesterday at least 4 other mothers tried to come in and pump at the same time. It was like the 405 at 8am! The entering mom’s knew it was me pumping from the quiet drone of my spectra pump. In trying to be effective, twice I left the in coming mother behind the curtain with me so I could clean up while she could set up. Both times we talked milk supply. There’s such a weird pressure to “perform” in our culture. Even with pumping milk. We are told by “them” how much to feed our babies and if you don’t reach certain milk goals during certain months of development your baby is going to starve and fall off the growth curve. That it the whole point of this blog. I want to normalize breastfeeding. I want to normalize milk supply and help reduce even a fraction of stress pumping mothers feel. Your baby is unique. Your story is unique. 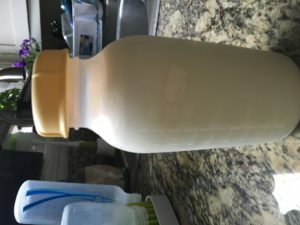 The amount and fat content of your milk is unique and specifically tailored to the individual needs of your baby. Remember breastmilk can vary from 13-35 calories per ounce! One mom I talked to yesterday could pump TWENTY OUNCES in one sitting first thing in the morning. I don’t think I’ve ever pumped more than 18 in a day across four pump sessions!! And yet my daughter is growing and healthy and following her 75 percentile growth curve. We need to stop letting “them” tell us how much and how often our baby needs milk and listen to our individual babies. Let’s support each other and encourage each other in our unique breastfeeding stories. I hope if you get nothing else out of these blog posts it’s encouragement to keep going, stop worrying, and own your personal breastfeeding story. Happy Pumping!! My entire day of pumping. Three 20 minute sessions during an 8 hour shift. A little over 9 ounces.